One cornerstone of the Reggio Emilia Philosophy is "real life experiences". This refers to the idea of bringing the project work to life by allowing the children to engage in hands on learning and to have an authentic experience directly related to the project work. This is a critical component of learning and building knowledge for children because it allows for a far deeper level of understanding, helping to foster an authentic love of learning, and allows children to construct knowledge and question deeper. When the children in the Sky classroom began to become interested in space travel, the teachers began to think of ways to bring space travel to life! Obviously we cannot shoot our little explores to the moon but we can find ways to bring space travel to them. 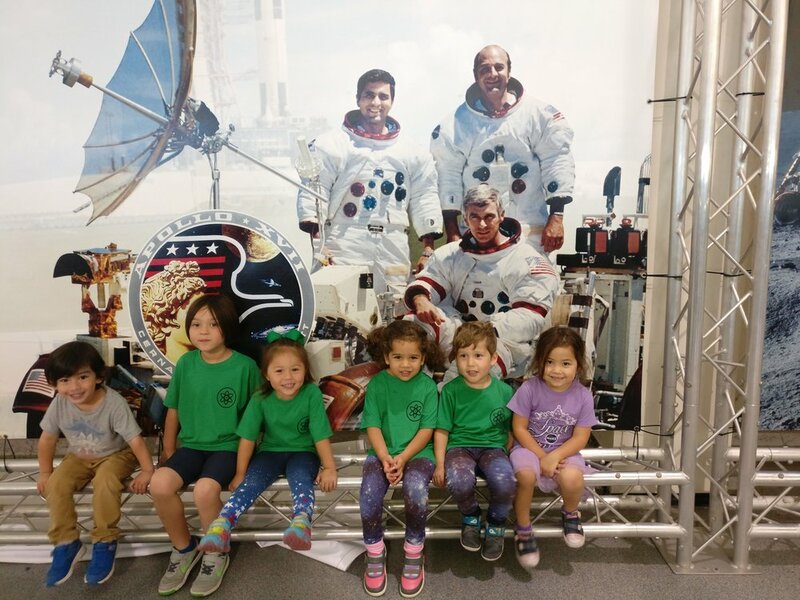 With the support of a parent who is a NASA engineer, the children were able to learn about the struggles of astronauts in space, explore real life tools made for astronauts, and try on a space helmet! One item the children were amazed by was the helmet. In the following days, the children worked with paper mache to create their own helmets. In class, the children explored why they would want to go to space, what is an astronaut and what foods do they eat. In an effort to bring space travel to the WIDE school, our music room was transformed into a spaceship traveling through space! The children proudly wore their helmets, ate real astronaut food, and got to simulate taking control of a command center. The culmination of this project led to a field trip to NASA, of course! The field trip was far more meaningful because of all the project work and exploring regarding space travel that was done before the trip to NASA. With the support of the ateliers, the classroom created a galaxy mural to share photos and write their thoughts about their field trip. This mural serves several important purposes - namely it is a visual provocation for the children to continue to wonder and question about space. The teachers are hearing things like, "We should make a spaceship!" and "Was does an astronaut do up there?". The teachers have supporting their questioning and the children are examining blueprints of space shuttles and learning about real men and women that have visited space. The teachers are also using this interest to reinforce counting backwards from 10! Language/Literacy: During the investigation, the children had to communicate and write about their ideas of space travel. We also read several books about space travel and practiced writing related words. Mathematics: The discussion of space travel in itself is mathematical. This project allowed the children to explore the concept of space, distance, time, and gravity. The creation of the helmet required estimation and counting. 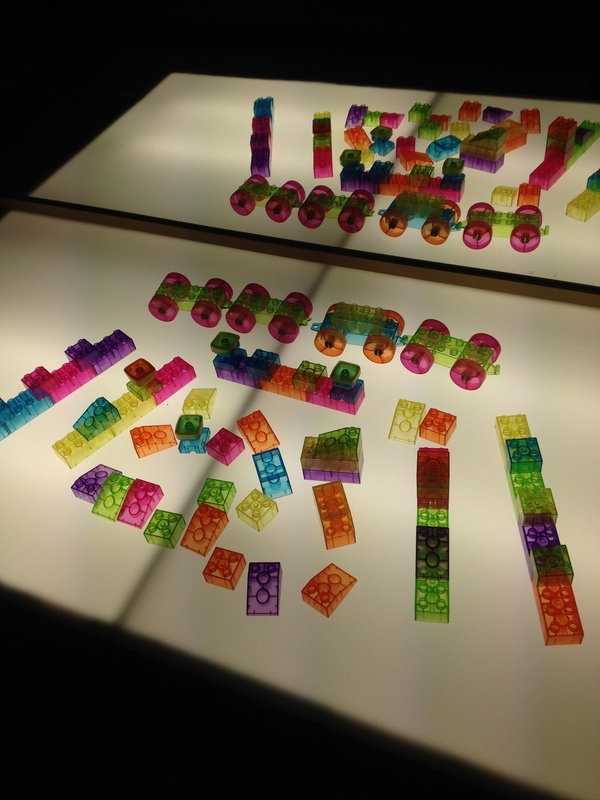 The children’s loose part creations were also used for counting and one to one correspondence. The children took turns placing numbers 1-10 backwards to create a countdown. Fine Motor Skills: The children exercised control and focus over their fine motor skills while making their helmets and various writing and drawings were continually incorporated into this project. Cognitive Thinking: Throughout this entire project, the children had to stretch their thinking into a world that is not tangible or directly observable. They were asked to make decisions and analyze abstract information. All of this reinforces their critical thinking skills. Social/Sense of Self: The children took this exciting journey of learning about space travel together. They helped each other make observations and engaged in discussions with peers, their teachers, and a guest speaker. The children’s “trip to space” in the music room was a wonderful way to support their relationship with each other and to see themselves as an important member of a community which ultimately also leads to a strong sense of self. Parental Support: Anytime a parent takes the time to do an activity with their child - especially an activity that is an extension of school work - the child receives the message that their work and learning is important and valuable. Please extend this project at home by discussing space travel, looking at photos of space or pictures taken from the Hubble telescope – anything you can think of that will spark a continued interest. these terms at home! 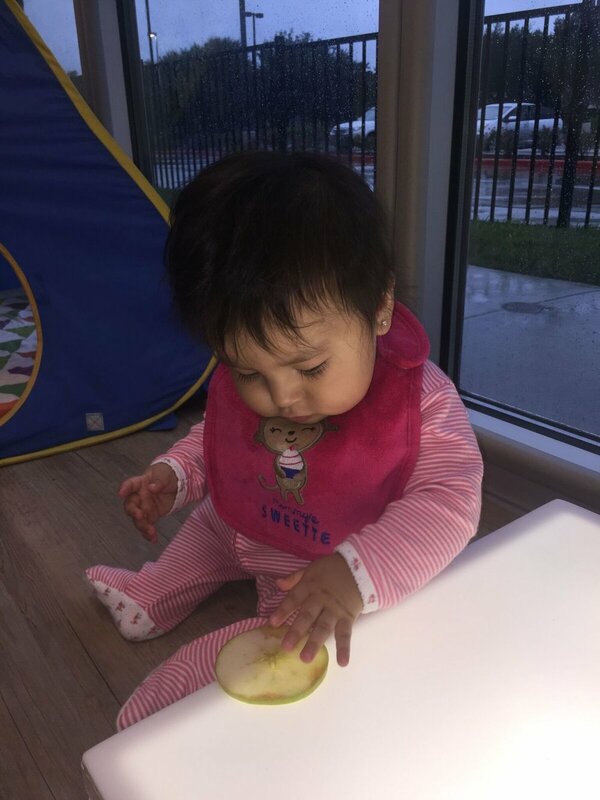 Let your child help slice various fruits/veggies. Explore the similarities or differences. Even a few minutes will greatly aid in your child reinforcing important concepts all on their own. 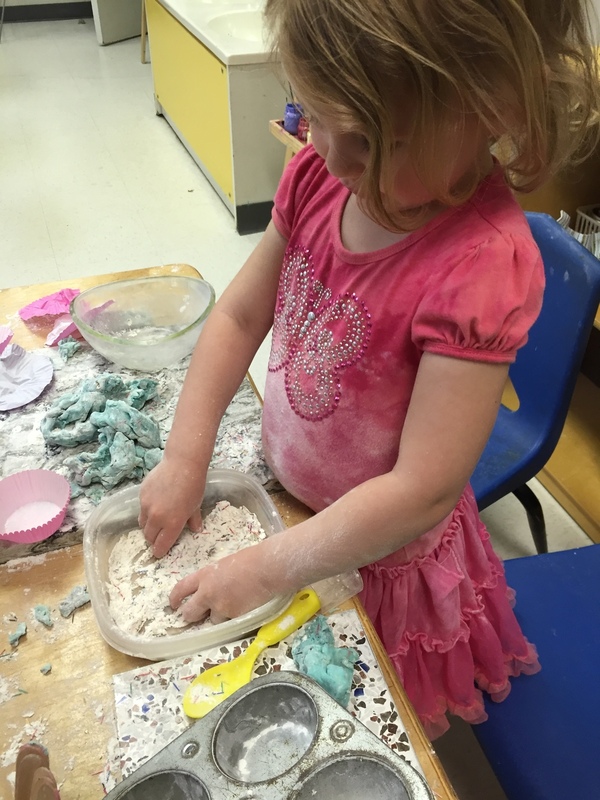 Have them explain to you what they notice and offer them materials to demonstrate their knowledge – this could be markers and paper, play dough, or finger painting! Feel free to take pictures of this process and to bring from home so they can share it with their class! In our school and in the Reggio Emilia Philosophy, the natural world around us should be revered, studied, and celebrated. Gabby, our school's Food as a Language Atelierista, works with every classroom, from infants through upper grades. 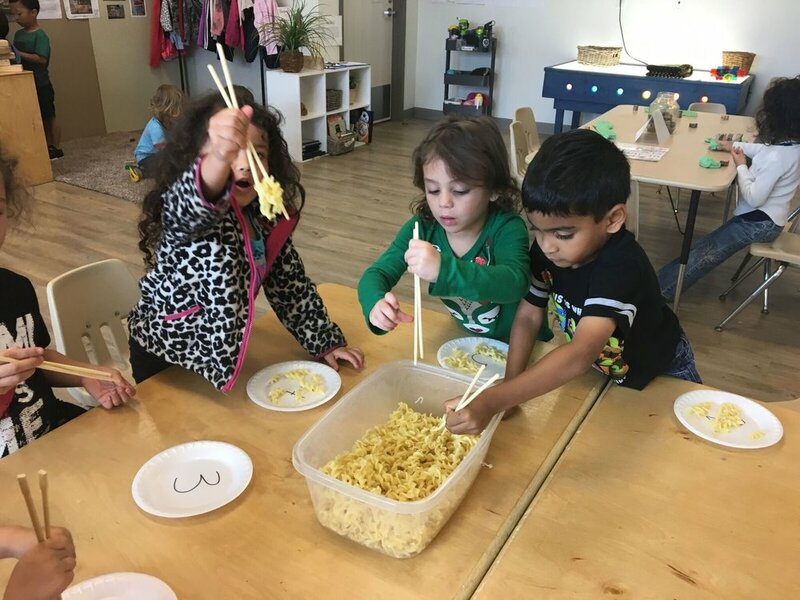 Investigating food allows for many wonderful discoveries and investigations: mathematical shapes and patterns present in foods, color theory, science of plants/foods, literacy, fine motor skills, social collaboration, and more. The children in the Seashell/Seaweed room have seen tomatoes many times - but this investigation with Gabby allowed them to see a tomato through different eyes. Gabby helped guide the children as they made several discoveries and found various shapes and patterns within the sliced tomato. The children found the location where the seeds are most concentrated and showed this understanding in the drawings. Observational drawings help children to practice several skills: focus, concentration, math, dimensional analysis, analytical skills, fine motor skills, etc. The children are also simultaneously learning about the natural world around them through investigating and analyzing foods! Mathematics: The children practiced and used mathematical knowledge to make connections and interpretations about the segmented tomato. When creating their drawings, the used directional analysis to create an accurate drawing. They counted seeds, which reinforces one to one correspondence and number sequencing. 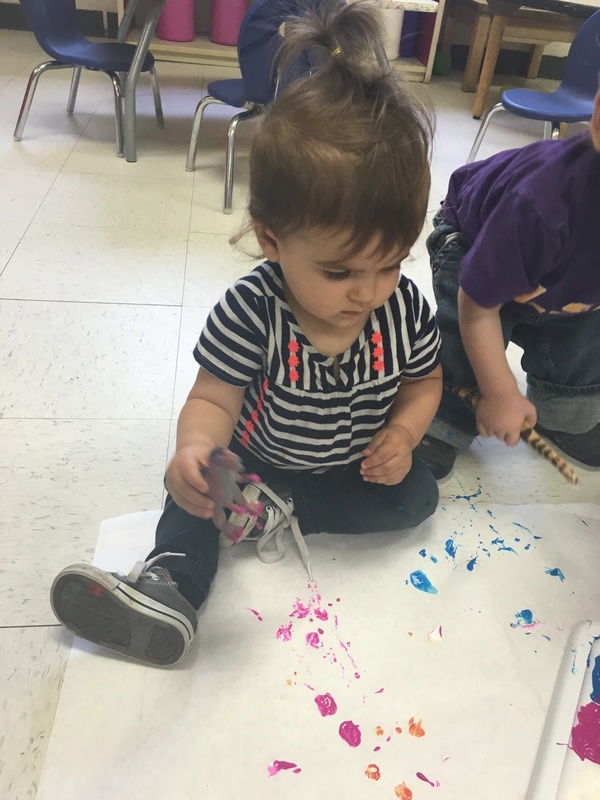 Fine Motor Skills: In order to create an accurate observational drawing, the children must exercise control and focus over their fine motor skills. 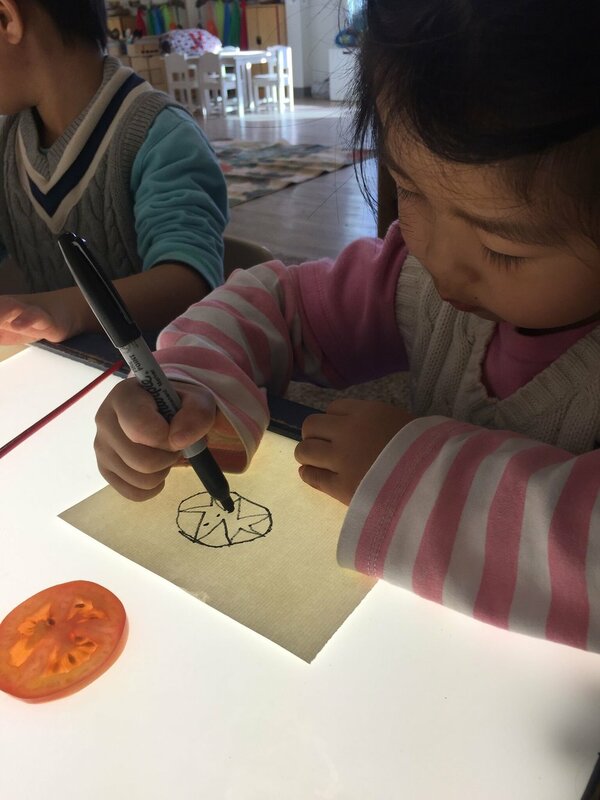 Cognitive Thinking: The children make connections and discoveries about the segmented tomato and connect this information to previous knowledge to continue to build their understanding of the world around them. Social/Sense of Self: Taking turns, helping each other make observations, engaging in discussion with peers and their teacher supports a strong sense of self. Parental Support: Anytime a parent takes the time to do an activity with their child - especially an activity that is an extension of school work - the child receives the message that their work and learning is important and valuable. Please extend this project at home by discussing these terms at home! Let your child help slice various fruits/veggies. Explore the similarities or differences. Even a few minutes will greatly aid in your child reinforcing important concepts all on their own. Have them explain to you what they notice and off them materials to demonstrate their knowledge – this could be markers and paper, play dough, finger painting or maybe they can guide you as you draw it! Feel free to take pictures of this process and to bring from home so they can share it with their class! 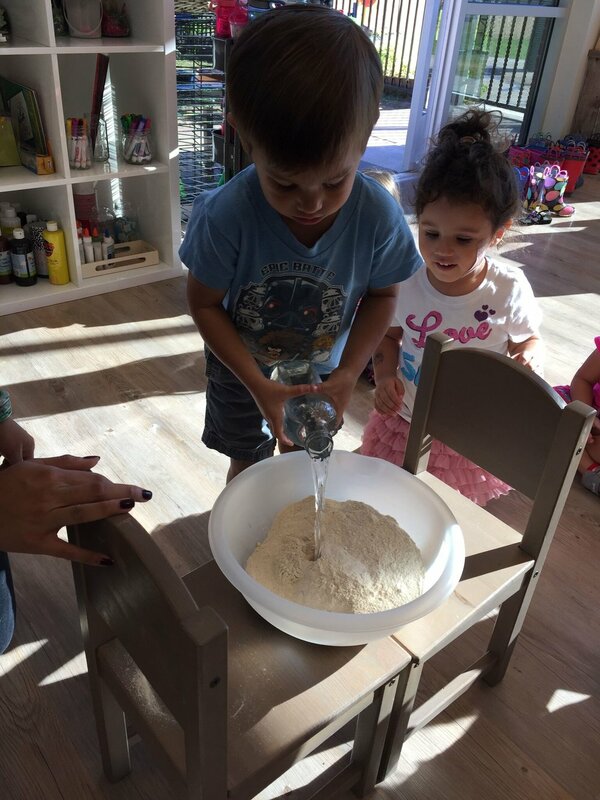 In the Reggio Emilia Philosophy, paying close attention to children is of paramount importance. Observing children, how they play, and their verbal and non-verbal communications allows for the teachers to extend their learning in an authentic way. When children are interested in what they are doing, they are far more engaged and this naturally leads to more critical thinking and long term learning. Most importantly, the child has a good experience with learning and being challenged. The children give their teachers infinite opportunities to infuse the projects with classic academics such as literacy, math, and science in a multi-sensory way. Below are some projects happening around the school that beautifully demonstrate children being engaged and learning on their own terms. With the international festival approaching, we have been learning about our diverse cultures. One student's heritage lead us to China. As we discussed Chin as a class, it led to a conversation about eating with chopsticks. We had a lesson on using chopsticks and incorporated math into our project! The children in the sky class have been making many lego boats and they enjoy the different provocations with play dough. To offer an additional challenge in critical thinking, the teachers set up two separate provocations for the children. With the lego boats, the children were challenged to predict if theirs would sink or float. 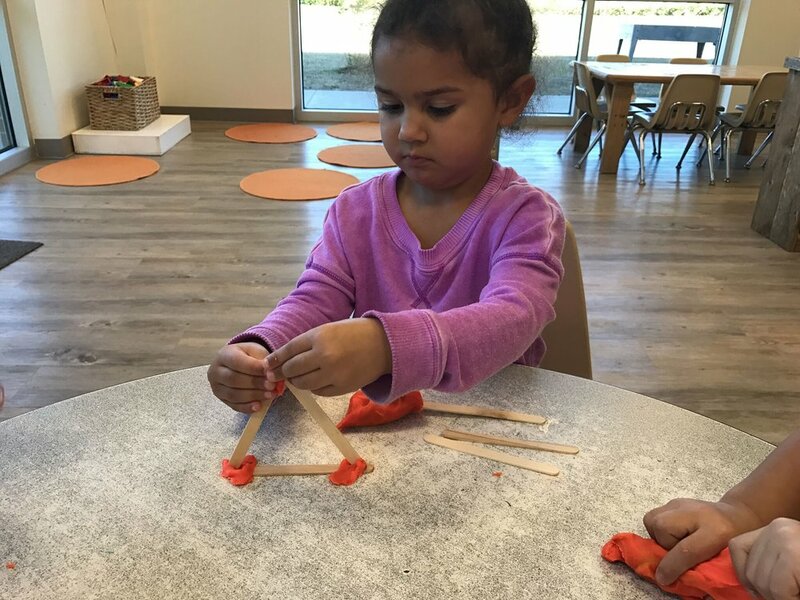 With play dough, the children were given popsicle sticks and challenged to make a 3D object - this is a common STEM activity because it incorporates so much math, physics, and analytical thinking into the creation. 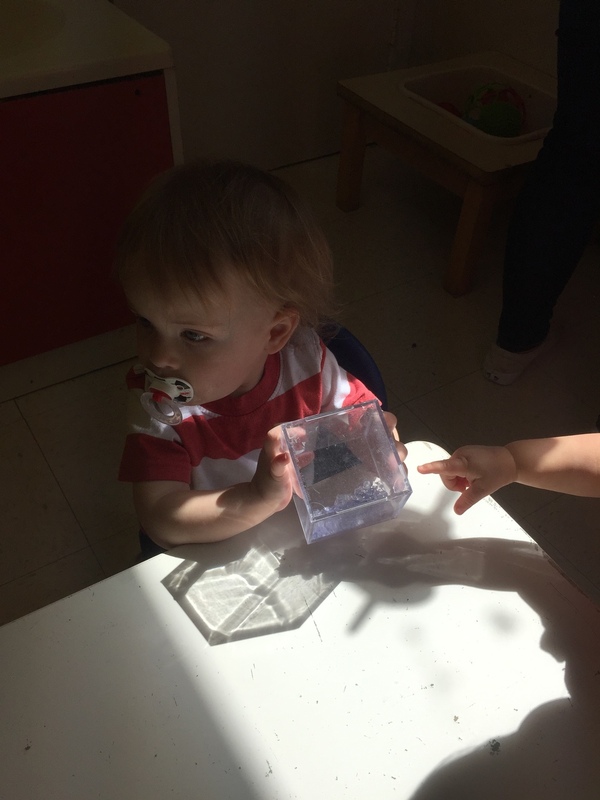 The children in the Sand class are still interested in shapes! We find shapes in the books we read, the drawings we paint, our faces, our environment and everywhere else we can! To further enrich this project, the teachers created shapes of glue lines with cut yarn for the children to place on the glue. This was a difficult fine motor and gross motor task for the children to complete but they did not give up! The children were also presented with tape outline of shapes and colors we have been discussing often in class. 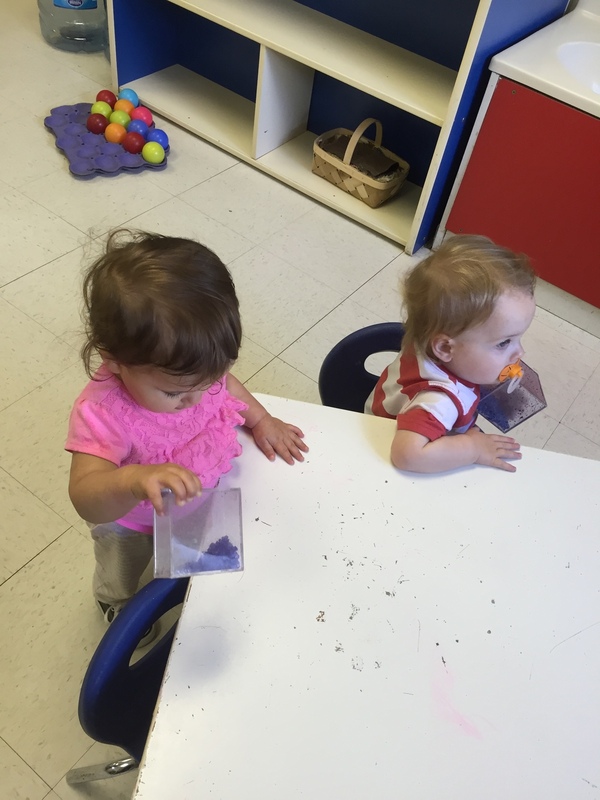 Our infants are constantly curious! Food is always a fascination at this age. They instinctively touch, squeeze, pinch, and explore food. 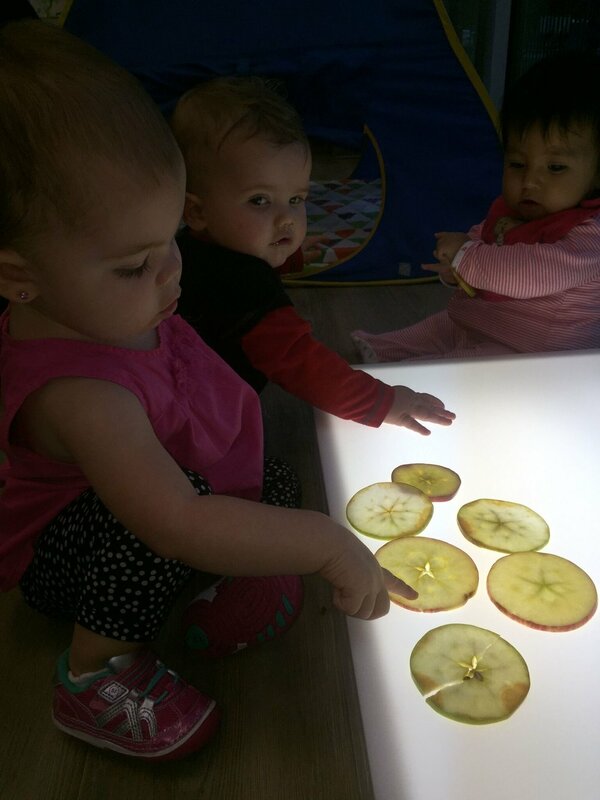 The teachers created a beautiful and inviting provocation with apple slices on the light table. 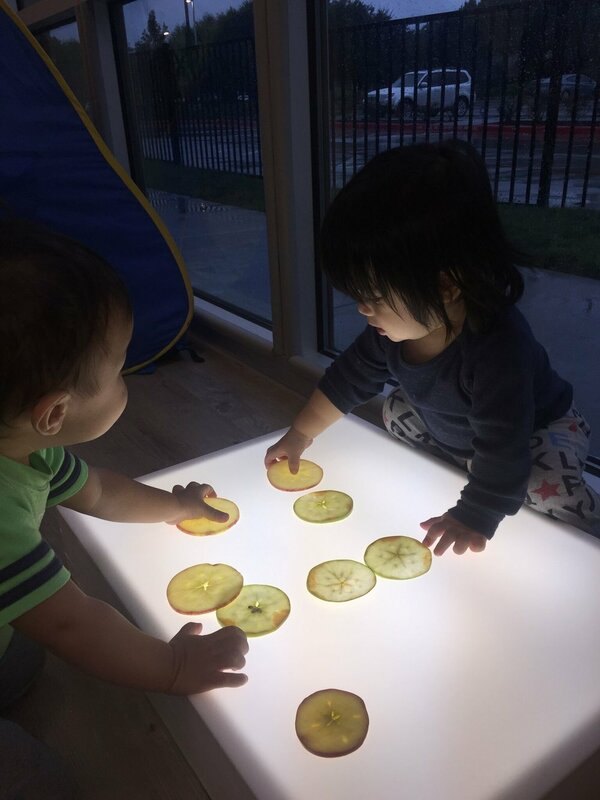 We encourage our infants to grow their natural curiosities by giving them plenty of sensory experiences and opportunities to make sense of the world around them. In our school cooperative play and learning is a large part of the day. When children are working on a project together, regardless of the complexity, they are learning critical social and emotional intelligence skills. They must read social cues like their friend being happy or upset by something they might be doing. The children must communicate their ideas and wants to each other. They must wait and problem solve every step of the way. The children in the Train class have been exploring movement with paint! In our school paint is used for countless explorations in academic areas, as a sensory medium, learning and experimenting with math/science concepts, art, literacy, and self expression. 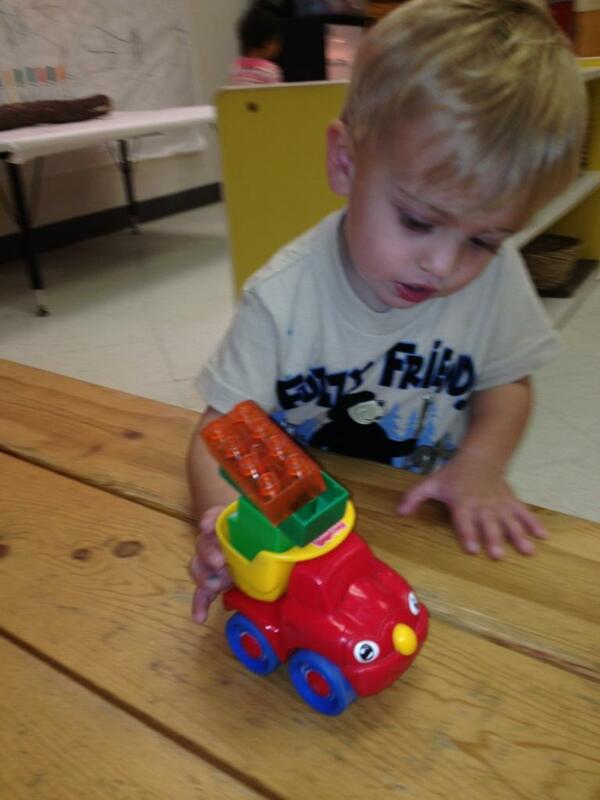 The children in the Train class also love to play with cars. The teachers set up a provocation for the children to merge paint and cars! The children discovered a covered table with large plates of paint and cars. The children began to dip their cars in the paint and create tracks. This is an excellent and engaging activity. As the children pushed their cars along the table, they became very interested in the tracks they were making and began to push the car in different directions and for varying distances to observe the cause and effect of their decisions. As the tracks became lighter and the children choose new colors to create tracks, they began to see the colors mix and new colors being created! The children shared their discoveries with each other as they discussed the colors they were using and creating. While the children were engaged in their explorations they began to talk and create stories about who was driving the cars and where they were going. This type of story telling is an important milestone for children and a strong link to literacy. They had to respect each other’s tracks and create self imposed boundaries which is a natural way to practice autonomy and self control. This project is a wonderful example of children being themselves, playing, learning, collaborating, and enjoying themselves while at school. Literacy/Language: Creating stories about who is driving the car and where the car is going are important skills of storytelling. The more stories children tell, the more they have a positive experience with fiction and using their imagination. Math/Science/Fine Motor Skills: As the children painted with their cars, the honed their fine motor skills to create the tracks they wanted. Mixing colors is a basic science experiment - the children take 2 separate colors to create a third. As the children continue mixing they are making decisions, gathering new information, making new decisions, etc. Color identification. Collaboration/Social/Sense of Self: The children had to communicate with each other to share the paints, cars, and the physical space on the table. The children were respecting each other’s boundaries, expressing their wants and ideas, and working together for the betterment of the group. These are critical skills that must be practiced over and over throughout childhood. Parental Support: Anytime a parent takes the time to do an activity with their child - especially an activity that is an extension of school work - the child receives the message that their work and learning is important and valuable. Please extend this project at home by creating your own tracks! You can use anything you or your child select: plastic animals, forks and spoons, family member’s handprints, sliced, food… the possibilities are endless. Feel free to take pictures of this process, bring in the tracks made, or bring the items used for your child to share with their class! In our school it is essential that children spend a considerable part of the day learning through play. We believe playing is an absolute necessity that children have. In allowing and promoting play throughout the classroom, the children are far more engaged, relaxed, and happy - which allows the children to be themselves. When children are in their authentic state of self, they can truly learn and develop emotionally, cognitively, and socially. Additionally, when children are playing and being themselves, the adults around them can observe their level of knowledge and stage of their emotional, cognitive, and social development. 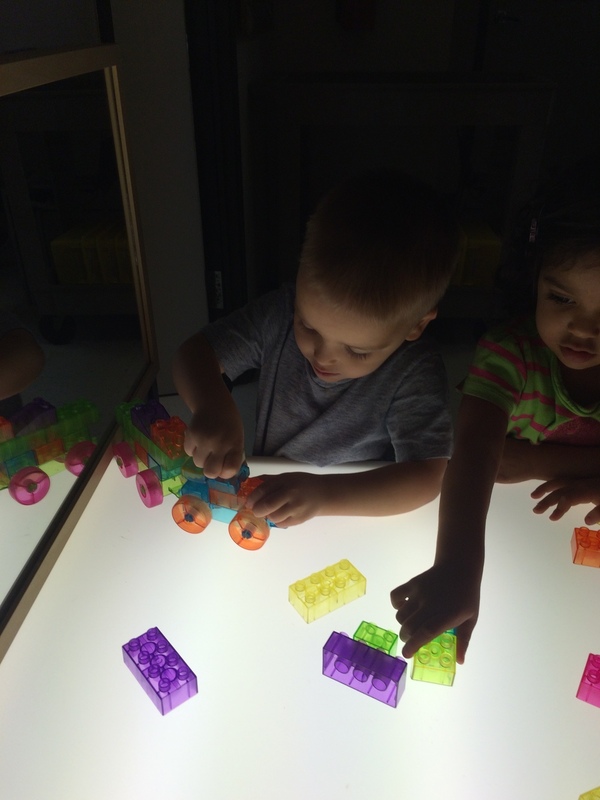 A recent child-led and play-based project emerged in the Day Sky and Night Sky Classrooms. The children in this room love to cook. They use real and pretend foods, play dough, sand, dirt, sticks, rocks, loose parts, and anything else their imagination can turn into a meal! It is truly amazing to see a child being so resourceful and imaginative by transforming anything available to them to carry out their ideas. When a child has the space and freedom to think and create their own ideas, they will naturally develop skills that will serve throughout life, such as: focus, determination, willingness to learn, and self initiation. This is not only true of children, but all ages of people. When someone feels that own part of something, they willingly work harder to realize their vision because they feel a sense of owndership. "How do you make that type of food?" "Where does that food come from?" They are endless questions that can led to the science of foods, different forms of cooking, raw vs cooked foods, cultural eating/cooking, geography, etc. One this day, as the teachers questioned the group, the answers helped the teachers realize that the children did not have a true understanding of the words "recipe" and "ingredient". This project could have taken a number of different paths but the teachers chose to explore the meaning of these 2 words. The children were then promoted to write these words while discussing letter sounds. 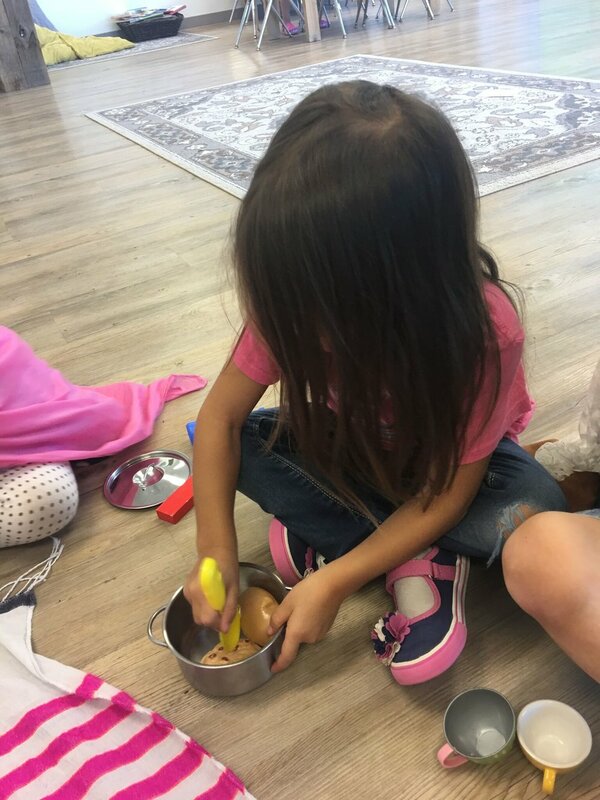 The teachers are also continually discussing what these words mean and are asking the children to create simple recipes they commonly pretend to make. 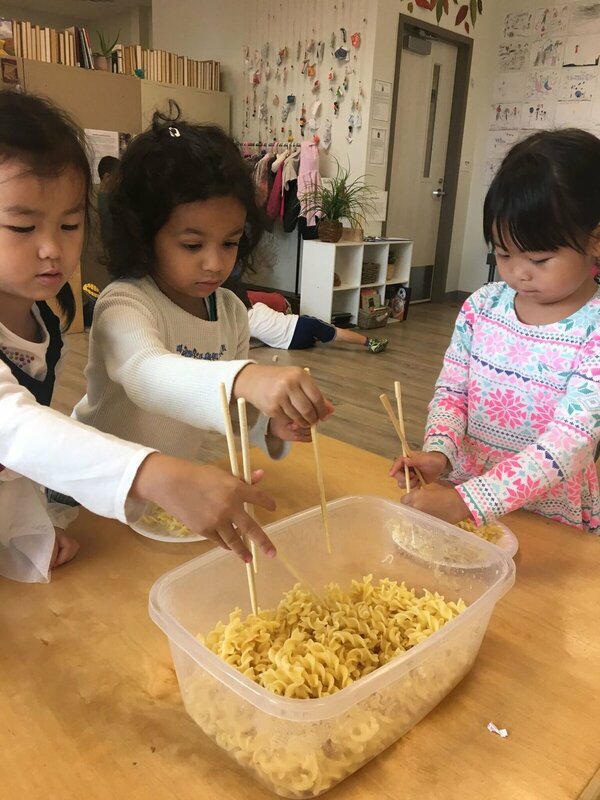 Mathematics/Fine Motor Skills: As the children "cook", they often have to count how many plates/bowls are available and then make the correct amount of "food" to fill them. This reinforces one to one correspondence, addition, and number sequencing. Collaboration/Language: The children had to communicate with each other what they were cooking, make decisions on who was cook which items, and decide on recipes. Cognitive Thinking: The children used loose parts to create their "foods" and build knowledge to understand the differences and similarities between foods that are ingredients vs recipes. The children also had to create recipes. Social/Sense of Self: Taking turns, helping each other, working on a collaborative project with their peers. Parental Support: Anytime a parent takes the time to do an activity with their child - especially an activity that is an extension of school work - the child receives the message that their work and learning is important and valuable. Please extend this project at home by discussing these terms at home! Let your child help you make a fruit salad (or any simple meal) by helping to create a recipe by selecting all the ingredients. You could also discuss a meal you plan to make and have your child help you make the recipe list for the grocery store. Feel free to take pictures of this process and to bring from home so they can share it with their class! The word provocation is one that you will hear often throughout our school. It is central to the child-led learning that happens every day. Provocations are set up by the teachers in an effort to introduce, reinforce, or further any topic of interest or an academic skill. Provocations are designed to “provoke” thinking and creativity! A provocation can be as simple as presenting natural materials like rocks, sticks, and leaves arranged in an inviting way on a table paired with paints and paper. The child is free to interpret the materials in any way they want. 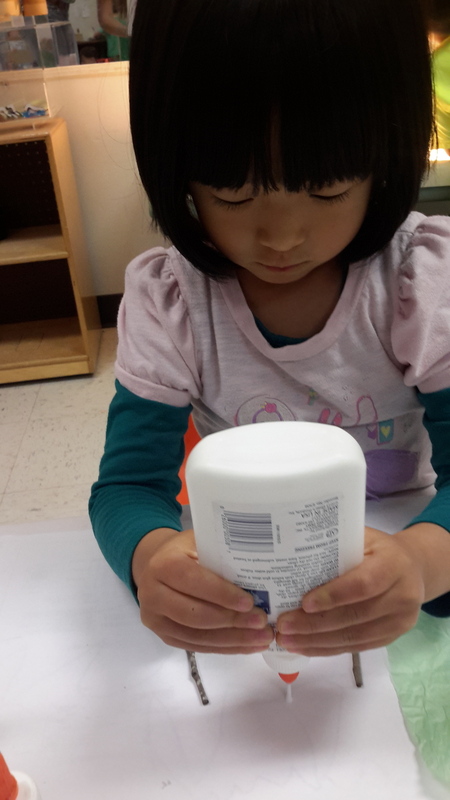 One child might arrange the materials to create an art piece. Another might start counting the items present or see how high they can stack the rocks and sticks. While another might use the sticks to paint the rocks while narrating a story. The goal is for the child to feel free and relaxed to think and create. 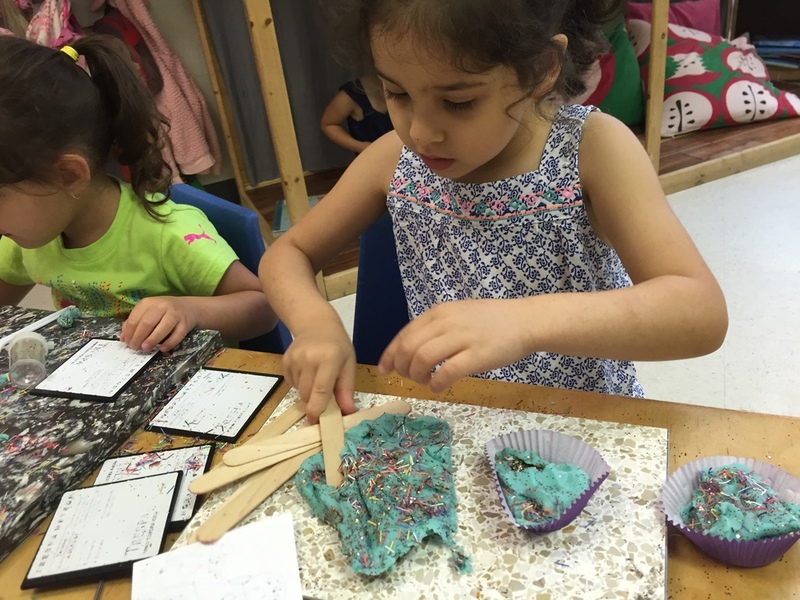 Provocations are especially wonderful because they allow each child to work within their comfort level and it exposes children to the unique ideas of their peers. This naturally lends children to learn from each other in a way that is authentic and true to who children are. Due to the vast nature of provocations, we will focus on 2 provocations created by the teachers for the Sand and Seaweed/Seashell Classrooms. Scribbles are taken seriously in our school. There has been a lot of research done about the early marks of human beings. In one long term research by Rhoda Kellogg, she determined that scribbles were not accidental markings but rather deliberate marks. She identified 20 basic scribbles. 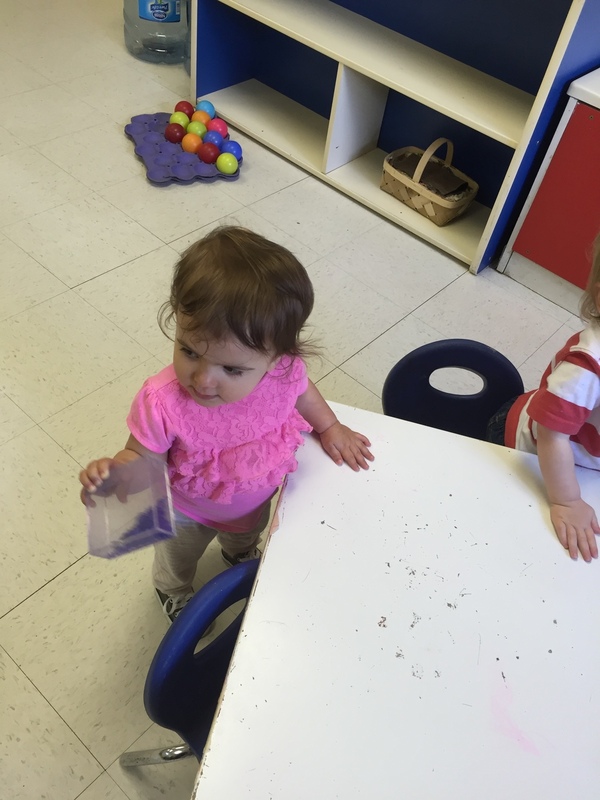 The children in the Sand Class are especially interested in circles! The teachers repeatedly see the children try to draw this shape and point out various things in their environment that are circular. The teachers created simple a provocation to extend their interest in circles. The teachers covered a large table with paper and paired this with circular lids and markers. 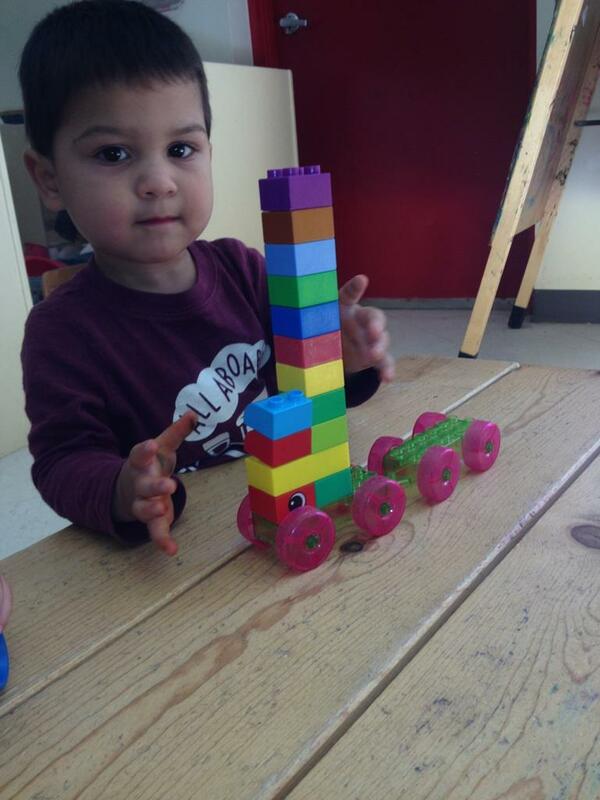 Providing the appropriate materials allows for the children to work longer and more thoughtfully. In this provocation, the markers are key to allow the child to see a vivid mark with every stroke! This simple detail encourages them to continue to make marks. Working with markers also has the built in fine motor skill of not only using the writing utensil but placing the lid back on the marker! 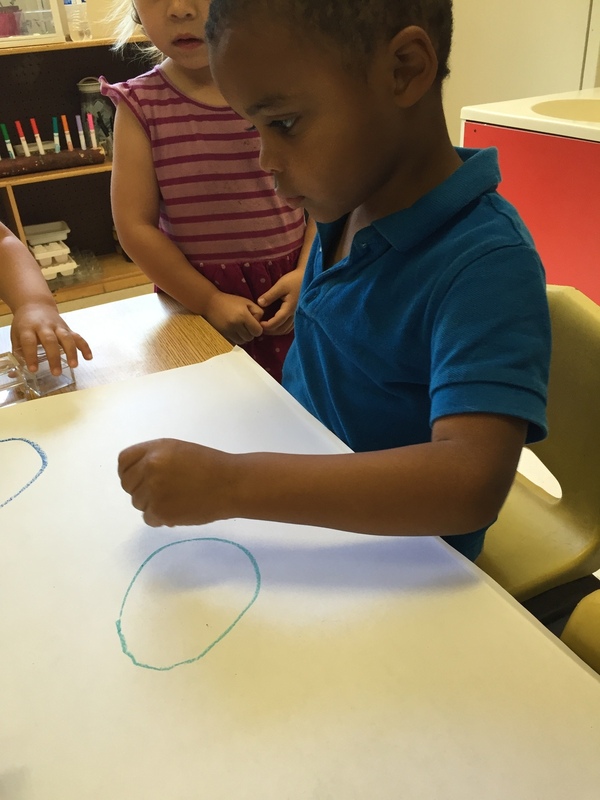 As the children drew circles they engaged in conversations and chose different colors to continue their marks. Parental Support: Anytime a parent takes the time to do an activity with their child - especially an activity that is an extension of school work - the child receives the message that their work and learning is important and valuable. Please extend this project at home by placing 3 varied shaped items on the table and asking your child to give you the one shaped like a circle. You can also go on a shape hunt around the house or have your child bring you things that are a circle. Point out circular items in the books you read together. Give your child pipe cleaners and make circles with them! This can be applied to any shape (or letter, number as your child gets older). Feel free to bring in their work from home so they can share it with their class! Math is all around us! In our school the children count constantly - we count steps, numbers of legs on animals, our friends in class, plates at lunch, beats of the drum, number of seeds, ladybugs we catch, and on... and on. The act of counting is adding. We highly recommend parents to read the book Young Children Reinvent Arithmetic by Constance Kamii to gain a deeper understanding of how children construct mathematical concepts and why our current educational math model is failing our children. Click HERE to buy the book on amazon. The books offers easy and fun games to play with your child that will greatly aid their development of number sense and give them a very strong mathematical foundation. The teachers in the Seaweed/Seashell Classroom know how important math is and created this provocation to allow the children to play with mathematical concepts like one to one correspondence, adding, and number sense. 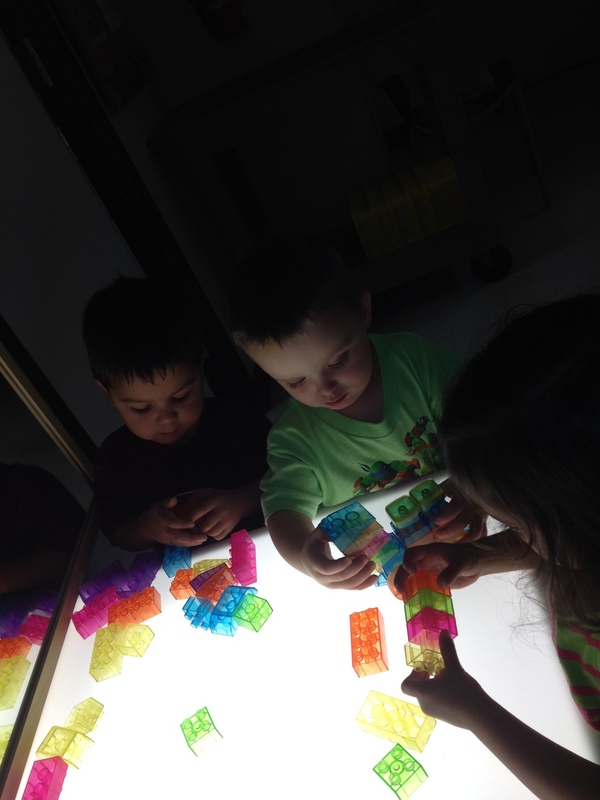 This provocation allowed each child to engage in this activity at a level that they are comfortable with. Children naturally learn from one another and they provided instant feedback to each other while they played. Parental Support: Anytime a parent takes the time to do an activity with their child - especially an activity that is an extension of school work - the child receives the message that their work and learning is important and valuable. 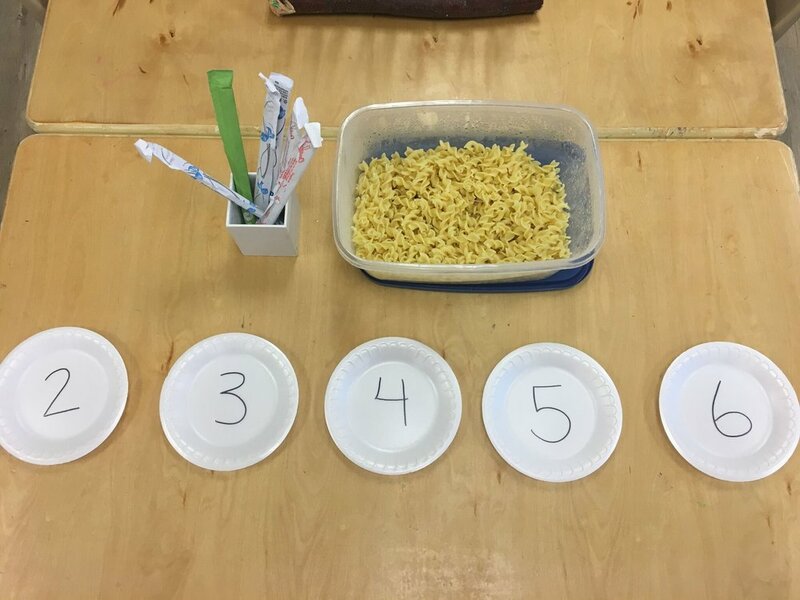 Please extend this project at home by placing small objects in a bowl with several cups that have large numbers. Ask your child to fill each cup with the amount designated on the cup. You can discuss which cups seem more full and ask why? If you feel your child is up to the challenge, use a cup with a number less than 5 and you place a few items the cup (but less than the number on the cup indicates) and ask your child how many more is needed to reach the desired amount written on the cup. Scramble the cups and ask your child to put them in order. Please bring in photos or anything else so your child can share it with the class! Every day the children sign in as they come into class. Teachers, parents, and classmates all help and support each other during sign in. We use the signing in process as an opportunity to help reinforce letter recognition and word formation. Another ongoing project in the class is using scissors. The children have been using scissors for almost every project in the classroom and their enjoyment of cutting is evident. Cutting is beneficial for several reasons. The small muscle groups in the hand that are used during cutting are also need for writing. 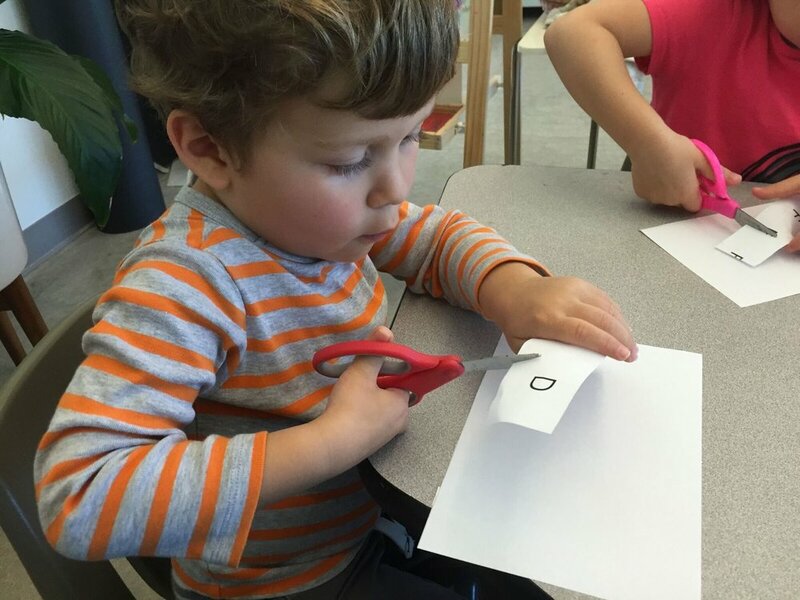 Manipulating paper with one hand while cutting with the other is a difficult skill for children to master. They must exercise patience, dexterity, and determination to be successful. In everything our children do throughout the day, we strive to present them with countless opportunities to see themselves as capable and determined people. The teachers decided to merge the process of signing in with cutting! The addition of scissors in the signing in process offered a level of novelty and challenge that really engaged the children. Letters were printed on strips of paper that were presented to the children. The children were excited to find the letters in their name and discovered that several children shared the same letters. As they identified letters, they had to think if those letters were in their own name and then the children cut out the letters and glue them in the correct sequence to form their name. This project had several challenging elements that incorporated different interests. Ultimately, the children were able to practice several important skills in a relaxed and playful way. Children will tend to challenge themselves, usually further than an adult would, when they feel capable, interested, and relaxed. We strive to provide opportunities throughout the day for children to strengthen their sense of self. Equipped with the right mindset, we can learn anything. 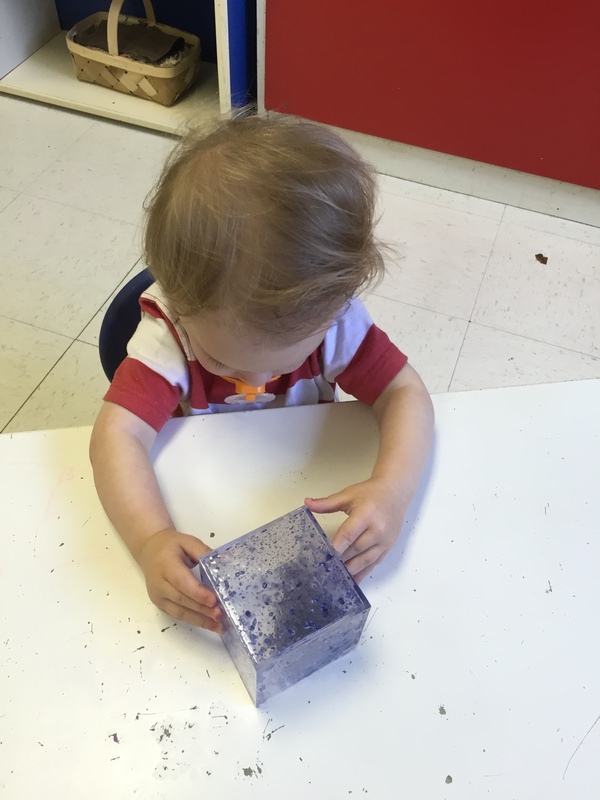 Mathematics/Fine Motor Skills: One to one correspondence, cutting shapes, gluing small letter cutouts onto the paper, spatial relationships, using glue properly (squeezing the bottle, getting the desired amount to come out, stopping the flow, etc). Collaboration/Language: The children often worked with each other to determine the letters in their name and recognition of the letters themselves. Cognitive Thinking: Not seeing their name written, the children had to think of all the letters in their name, cut them out, and keep track of which letters were missing. This provocation reinforced that our 26 letter alphabet makes up many, many words - including all the names in our class! Social/Sense of Self: Taking turns, helping each other, seeing themselves as capable individuals but also with a connection to a group. Extensions: The teachers plan to continue using cutting in the sign in process and will incorporate more math into the project. Parental Support: Anytime a parent takes the time to do an activity with their child - especially an activity that is an extension of school work - the child receives the message that their work and learning is important and valuable. Please extend this project at home by giving your child a magazine or newspaper and asking them to cut out the letters in their name (or anyone's name). Feel free to bring in their work from home so they can tell their class about their experience! When it comes to gaining true understanding about the natural world, text and photos can only take a child so far. We believe that spending time outside and allowing the students to experience nature firsthand takes the learning experience to a whole new level, engaging the students senses in new and exciting ways. Over the past couple of weeks we have been observing a mother bird and her baby bird in our outdoor area. When the children go outside each day they run towards the bird’s nest, eager to check on the little feathered family. With each visit, the children have been able to make a variety of observations regarding important scientific concepts such as the animal’s life cycle, habitat and other physical and behavioral characteristics. The children have been observing how the mother bird feeds the baby bird and have been talking about how “the baby bird is growing.” Noting the bird’s feeding habits and growth rate reinforces valuable scientific skills and concepts such as careful observation, measurement, comparison and cause and effect. The children also got to watch the baby bird try to fly. This was quite exciting for them because they have been observing the baby bird from the moment it hatched from its egg. While the bird was practicing flying he got stuck inside of the fence but he quickly figured out how to get free. The birds have been a popular topic of conversation between the students, increasing communication skills and unity within the class. By spending time outside with the birds, the children not only expanded their scientific knowledge, but they also formed a special connection with the natural world around them. Getting a daily glimpse of the baby’s transformation allowed for a unique sense of attachment, appreciation and curiosity to grow within the children, increasing their interest in learning and their thrill as they witnessed the bird take its first flight. Encouraging children to interact and connect with nature in a meaningful way is important because it allows them to better understand their potential impact on the environment, furthering their development into environmentally responsible individuals. Lately our students have shown quite a bit of interest in the toy dinosaurs we have in our classroom. 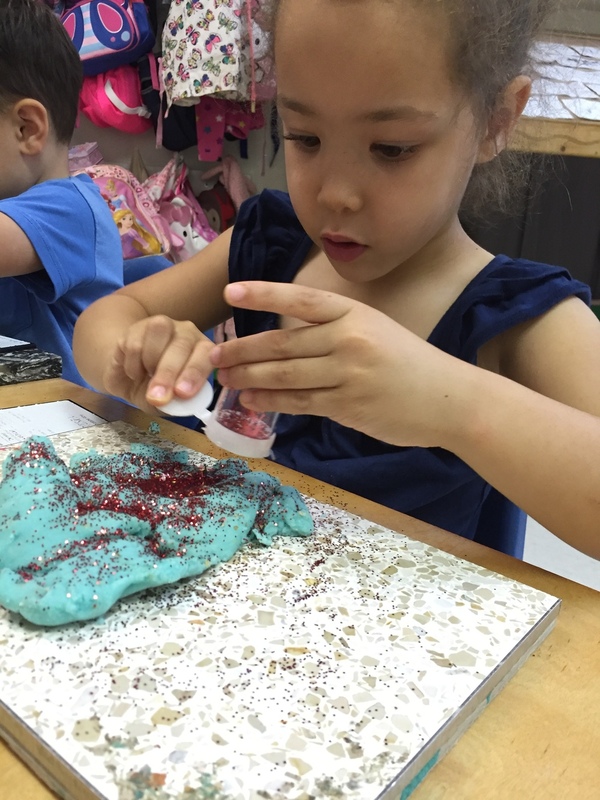 Our curriculum encourages forming provocations based upon student interests to achieve optimum levels of engagement and to satisfy their existing curiosity. 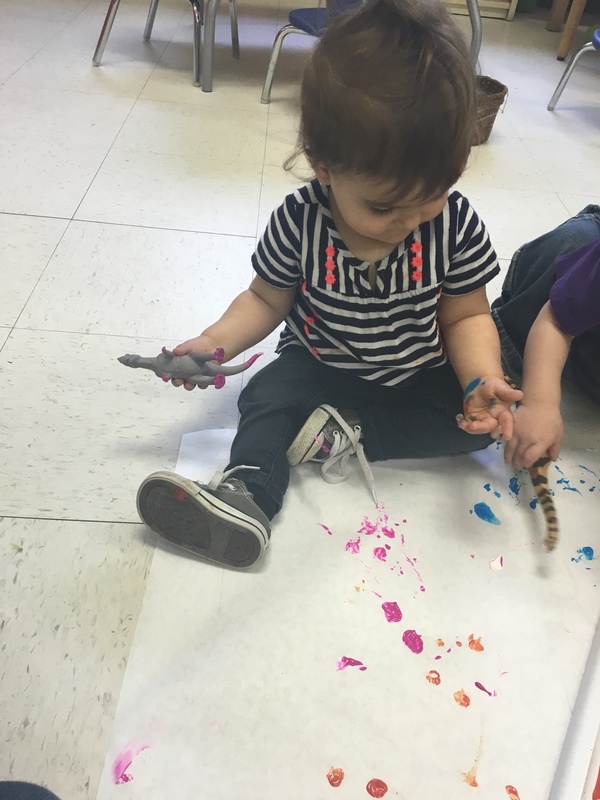 In this exploration, we played off of their interest in dinosaurs by bringing out some of the toys and paints in a variety of colors. Once the materials were made available, we stepped back and let the exploring begin! 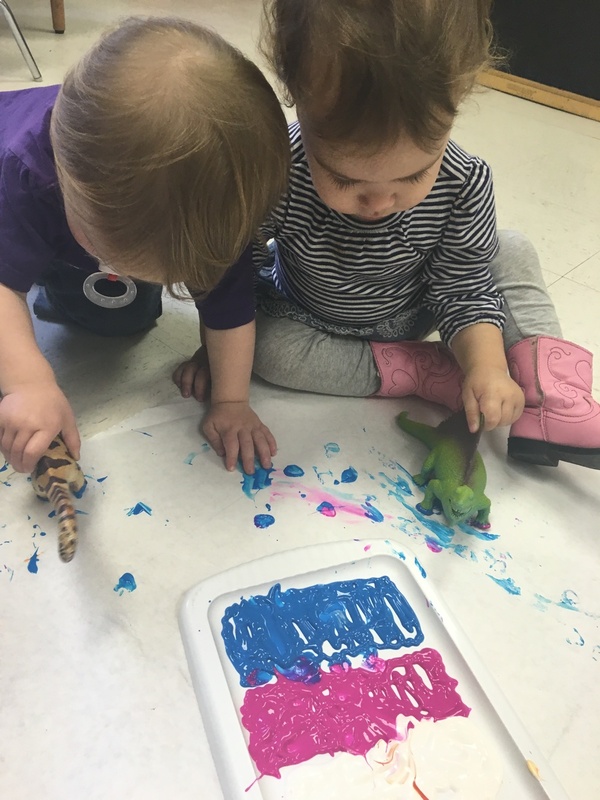 Pairing the new, exciting toys with a more familiar tool like paint allowed the children to have a fun, relaxed time of free-play and learning. 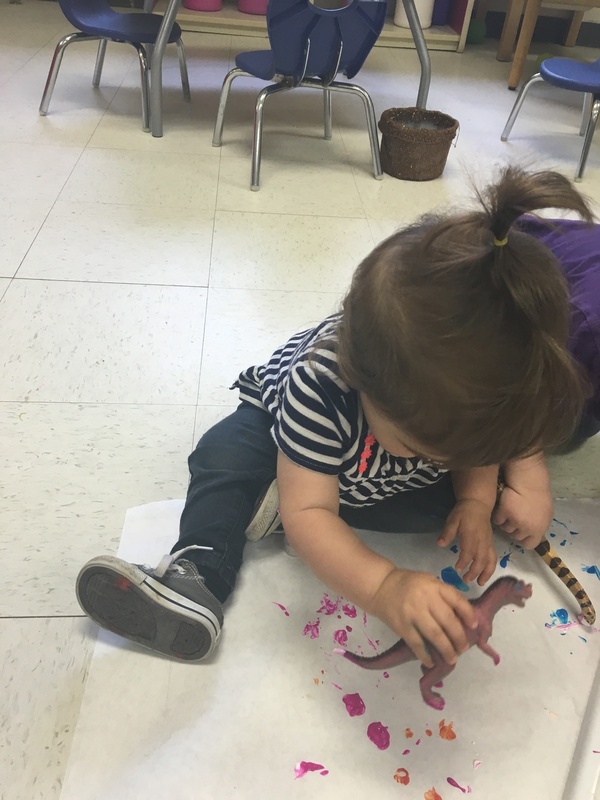 The children quickly began to dip the dinosaurs in the paint. They then placed the dinosaurs on the paper, creating footprints. Each dinosaur left a unique set of print marks, varying in shape and size. Eventually the footprints turned into whole sets of tracks, showcasing different colors and patterns on the paper. Creating, observing and comparing different shapes, sizes and patterns are foundational concepts of mathematics and geometry. This activity also allowed the children to engage and build upon other skill sets ranging from color identification to interpersonal communication. Not explicitly a team activity, the children were free to individually create and paint in accordance with their own imagination. However, sharing space, paint and tools allowed them to practice working side by side, fostering a comfortable environment for any desired relationship building or collaboration to take place. We are very excited to share that our plants have all begun to grow! The children are so eager to check on the growth of our plants every day, so we created a system to track the growth. The children enjoy the daily process of caring for the plants and especially love being able to see the tangible results of their hard work in the form of measurable plant growth. We begin every morning by watering the plants and measuring the growth of each one. As a means of tracking the growth, the children draw a picture every week that represents the changes that they observe in the sprouts. We have these pictures displayed on the wall for the children to look back on, resembling a timeline! After watering the plants and drawing our observations, the students take the plants outside to get some sun. This ongoing plant care process has been a valuable experience for our students for quite a few reasons. It has given them an opportunity to learn how to initiate and maintain a healthy daily habit. By caring for the plants each day, they have learned how their actions can impact the world around them. The daily care and measurements have allowed them to better grasp the concept of cause and effect. The positive results (plant growth) have reinforced their positive behaviors (diligently caring for the plants). The recording of plant growth through drawing is important because it gives the children an opportunity to document their observations in a unique way, expressing creativity, exercising the imagination, and carefully thinking through their observations of the plant characteristics. Working with the drawing utensils builds on their fine motor skills. Using art to document information leaves the students with a record of what they learned that is useful for future comparisons and a lot more fun to look at than numbers on a page. We are going to continue to care for and document the growth of our plants. Feel free to come check out our timeline in the classroom! Texture plays a large role in how we interact with and view the world on a daily basis. It can be observed through our senses of touch, sight and even sound. We recently spent time engaging our senses, and our inner artists, by exploring a variety of different textures using trace paper, glue, watercolors and flower petals. The children dipped the trace paper and petals into a mixture of glue and watercolors and placed the materials on a larger sheet of paper to dry. Both the creation process and the final results abounded in discoveries about texture. During the creation process, the children could note the thin, smooth textures of the trace paper and flower petals. As they dipped the materials into the mixture, they were greeted by new sticky and watery textures. They could also note the difference between the feelings of the trace paper before and after it was submerged in liquid as it transformed from a smooth, solid sheet into a mushy bunch. Once the papers and petals were placed and dried, the final product looked very interesting. It had a three-dimensional aspect, with some areas appearing crinkled or rigid and others looking flat or round. 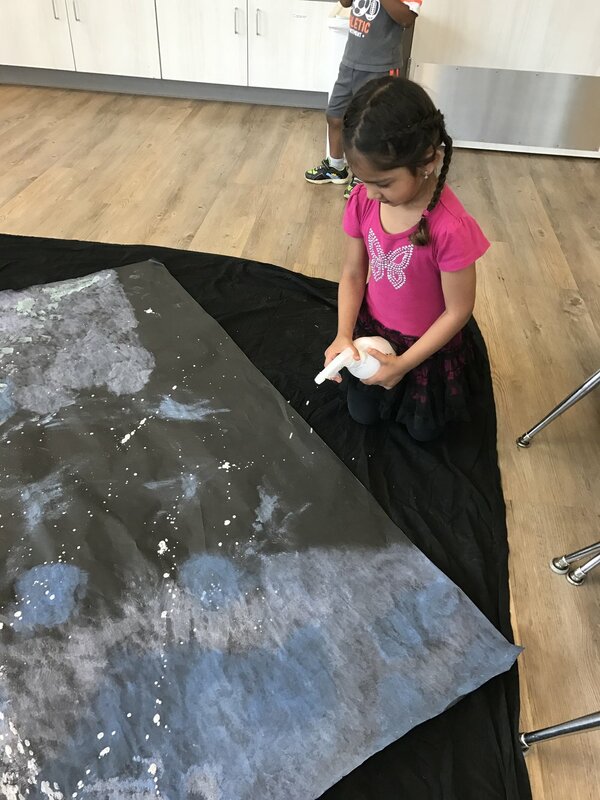 This encouraged the children to make connections between visual and physical textures, noting that the areas that looked crinkled also felt rougher to the touch. 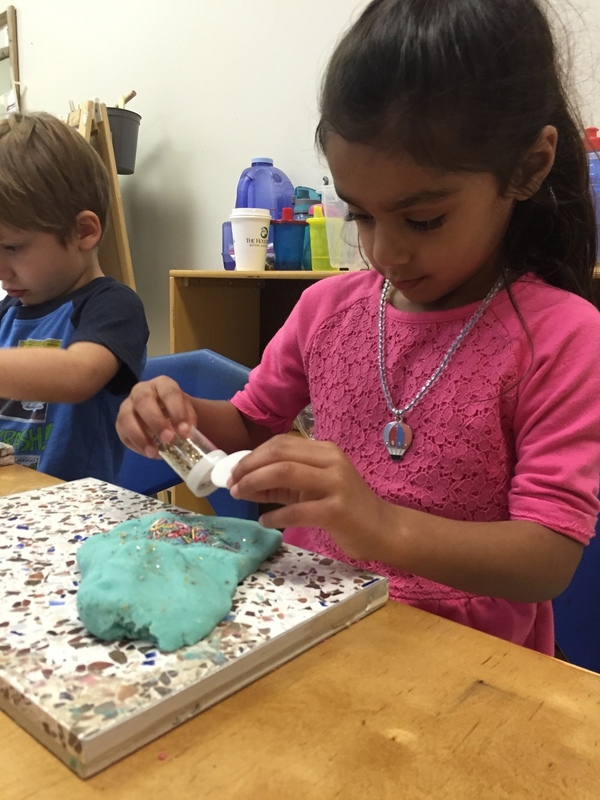 This tactile experience also allowed the children to practice their fine motor skills as they dipped, pushed and squished the different materials into the watercolor/glue mixture and onto the paper. 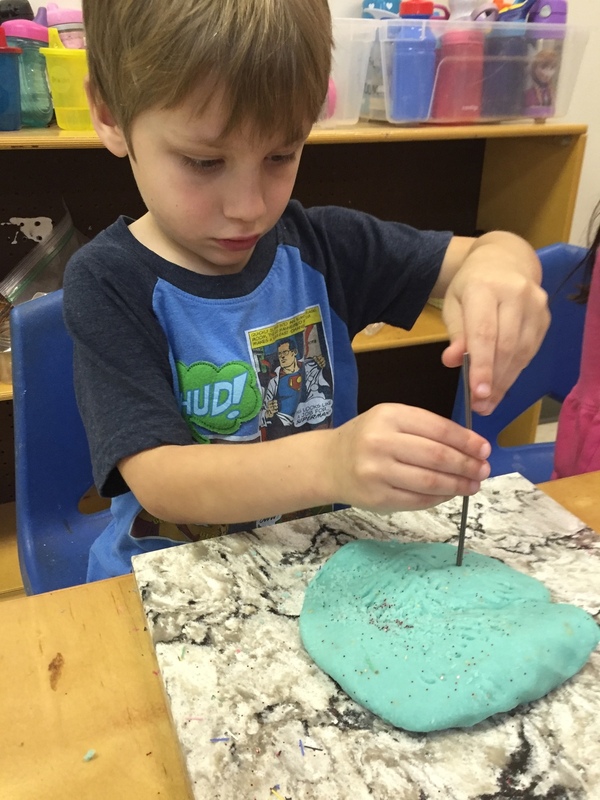 Through this exploration the children were able to learn the important role that texture plays in art, both physically and visually, and how to create and change textures of different materials. Learning about color is a key part of childhood development. Being able to recognize colors, match them with their proper names, and understand how and why they exist are all extremely important skills for children to obtain. 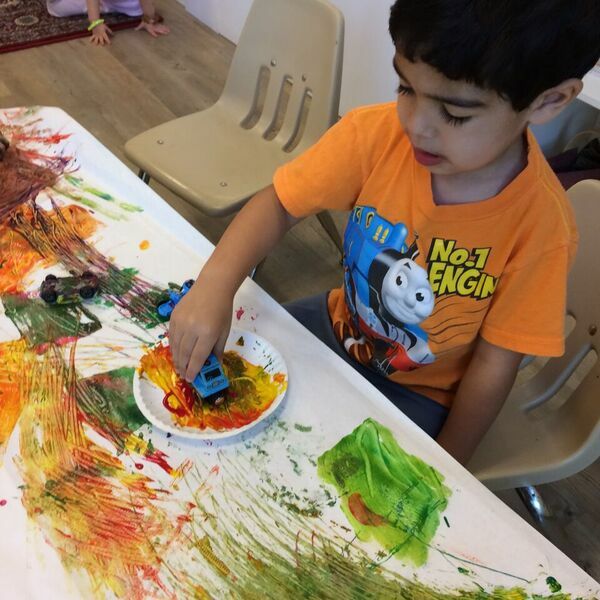 Because color plays such a large role in the world around us, and in art in particular, we believe it is important for children to fully understand where colors originate from and how to create them. We recently focused on introducing primary colors to the children. They used cotton swabs to mix red, yellow and blue to create other colors like purple, orange and green. They were encouraged to explore how all of the colors worked together and separately. This gave the children a chance to practice color/word association. By learning to create colors on their own, the children gained a sense of independence. Having the ability to expand their color set is important in matching the pace at which their imaginations and desires for creative expression are growing. This experience also allowed the children to explore the many different shapes that the cotton swab created. There are a lot of circles and lines in their work. Creating these types of shapes are fundamental for their motor skill development and understanding of geometry. Artistic expression is one of many languages that we value within our curriculum. As a child’s understanding of color expands, their means of self-expression and resources for documenting the world from their perspective also expands. Lately, we have noticed that some of the children have started confusing the names of certain bugs and insects that they have come across in our classroom. To resolve this confusion and further our understanding of insect names, we set up an exploration. The children were excited to see our critters out of their natural habitats. They immediately started grabbing the cubes and excitedly shouting out which ones they had in their possession. We asked the students if they knew what words were on the paper and they all responded by saying “I don’t know.” We took this opportunity to explain to the children the different word in each square. Some of the children started to place the critters that they had in their hand into separate sections. They repeatedly asked us which section was what. We talked about the first letter of each section to help them connect it to the name of the critter and some of the children helped their classmates find their correct section. While they were relocating the bugs, some of the children wanted to bring chalk and oil pastels to draw their bugs on the paper. The children drew bodies, legs and antennas in each of the sections. They enjoyed rubbing their hand and arms on the areas that chalk was used. The bright colors rubbed off on their skin and some of them even started to draw on their arms. By categorizing the bugs into their correct sections, the children practiced word association. Learning to properly label and name items is an important aspect of communication skill development. Writing the bug names on the table and using the first letters of the names to give the children “hints” also increased the children’s general letter and word recognition skills. In helping one another find the appropriate category for the bugs, the children practiced teamwork, encouraged positive relationships and enhanced their interpersonal communication skills. Drawing the bugs in their correct sections also allowed the children to further instill their mental connection between each bug name and that bug’s unique characteristics, as a means of remembering the appropriate name. While this began as a communications based exploration, it also built upon other cognitive skills like counting and categorizing. 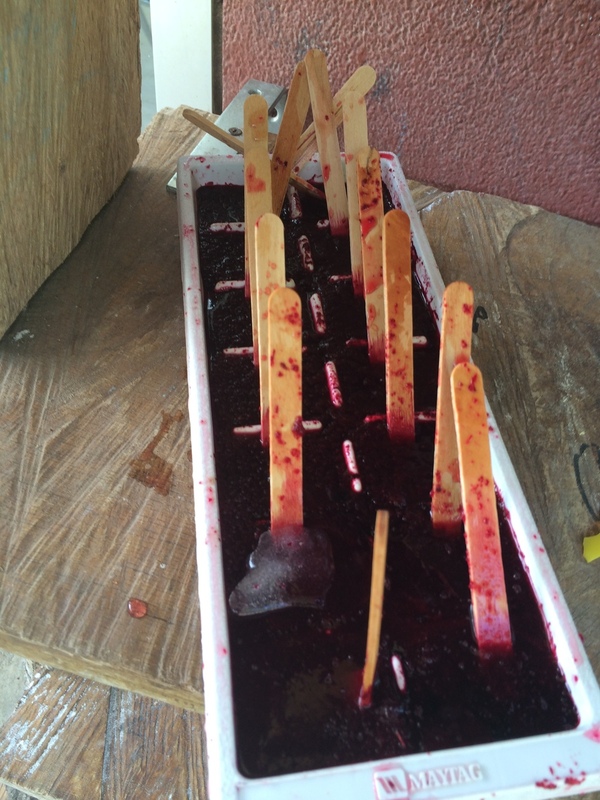 As a continuance of our classroom exploration of beets, the students recently engaged in a time of sensory play involving sugar beet juice popsicles. 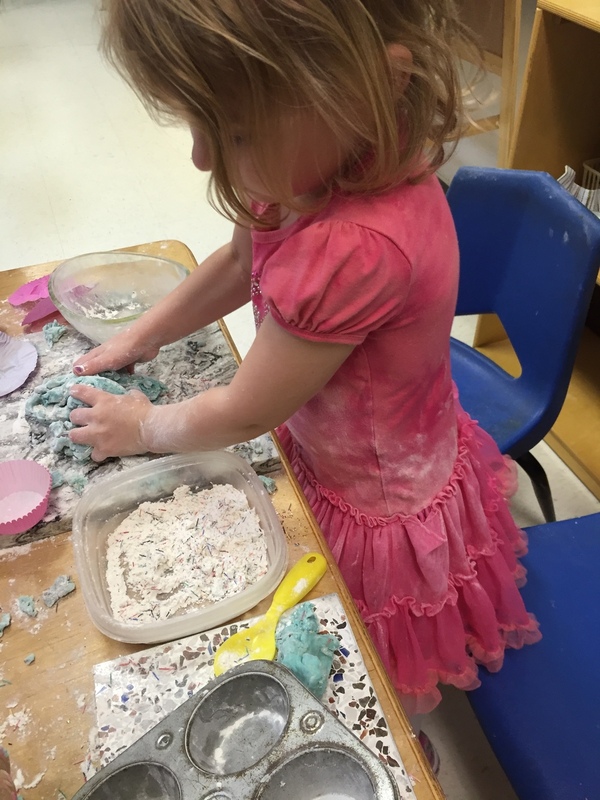 Sensory play is comprised of any activity that excites a child’s senses, encouraging them to engage in developmental processes as they play, satisfy their curiosities and express their imaginations. How does it feel (hot or cold)? What is happening to the popsicle when you play with it? Why is it changing shape? Asking questions challenges children to solidify their thoughts and ideas. Discussing topics and hearing other’s explanations expands existing knowledge and ideas. These conversations are also important because they increase children’s communicative skills, as they practice adequately articulating their personal thoughts. 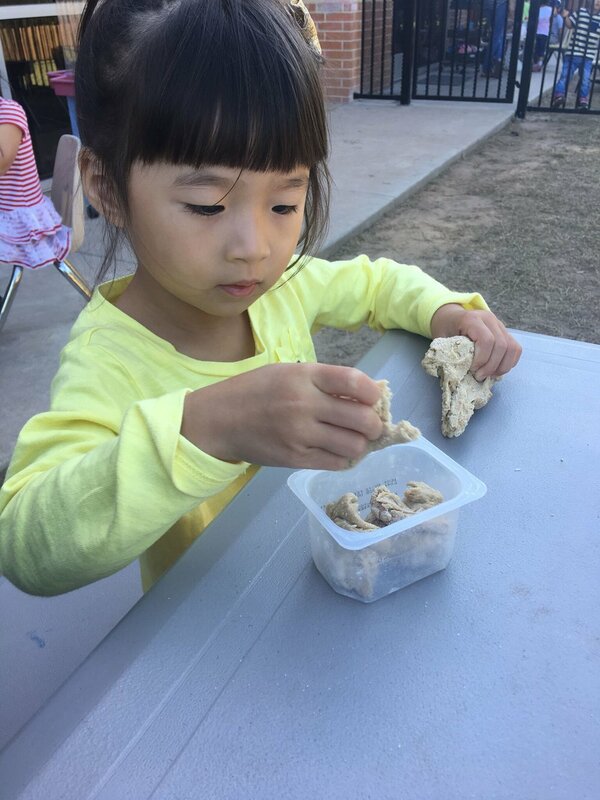 As the children used their senses to make observations, they were able to build upon their understanding of cause and effect, temperature and texture. The dark, rich coloring of the juice kept the children’s visual senses engaged, encouraging them to study it further. Using their sense of touch they noted the stark difference between the hard, cold popsicle and the warmer, squishier beet the children had previously encountered. Another primary lesson the children took away from this exploration was the process of physical state change. Using their senses of sight and touch to observe the frozen cube melting into a warm, sticky juice allowed the students to better grasp this considerably challenging scientific concept. We will continue to study the beets via different methods and in different environments. The more we explore and observe the food, the deeper an understanding we have about its characteristics. 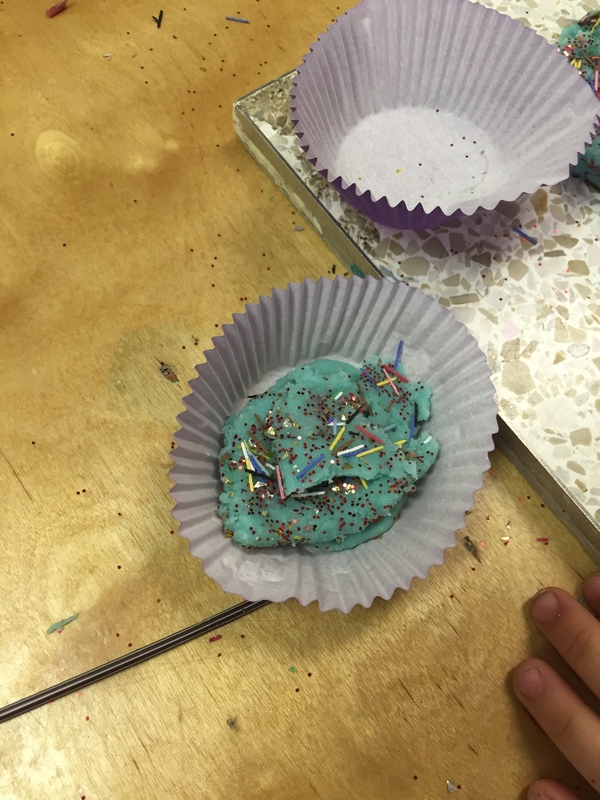 Recently, the children in House Room have been spending time “baking” cupcakes in the playdough area. 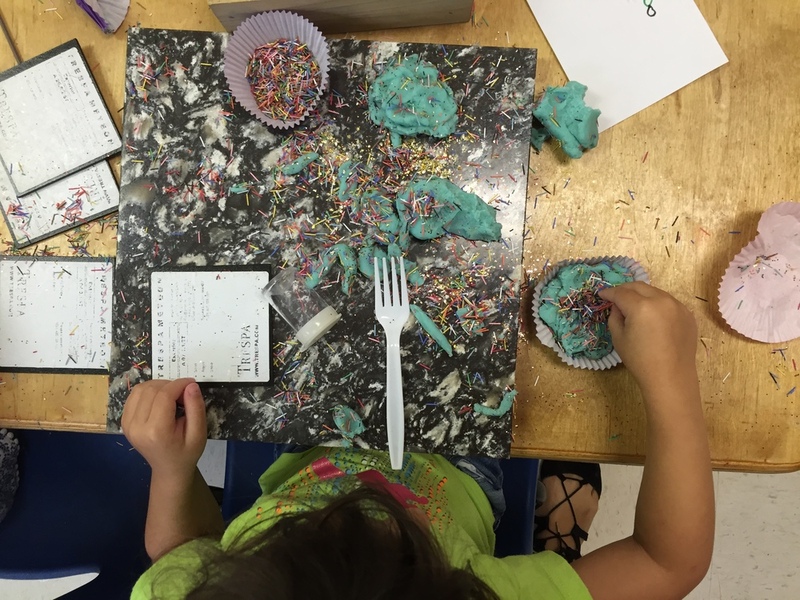 To spur on the children’s interest and support their exploration, we decided to ask them what other materials might be needed to continue making the cupcakes. Later that day we introduced all of the new materials that the children requested, along with some flour to enhance the experience. Immediately, the children got back to work creating their cupcakes. 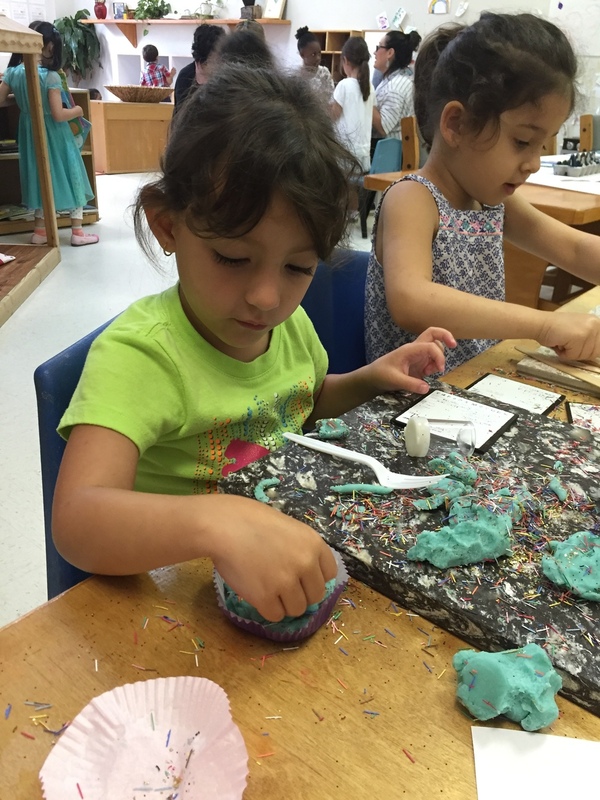 With access to the new tools, many of the children began to create their own versions of cupcake recipes. They also began to help their friends with create their own recipes and obtain ingredients. Dramatic play experiences like this one are important in childhood social, emotional, cognitive and creative development. The children showcased their imagination by role-playing as bakers. 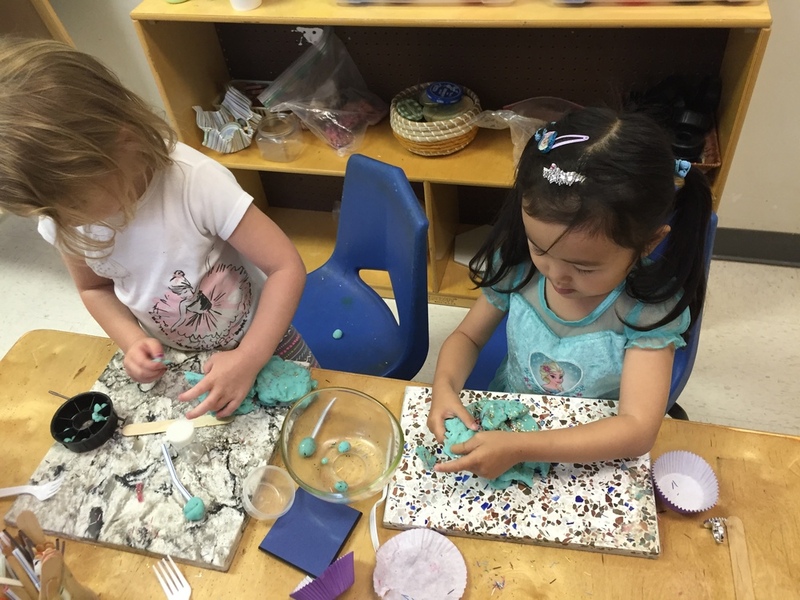 They merged make-believe and reality by using both real kitchen materials and representative materials like playdough as props for their baking. Inventing new “recipes” put their creativity on display, but also showed their understanding of the need for processes in real life. The creative and imaginative aspects of dramatic play are important because they reveal a child’s understanding of real life activities, ability to make connections between real life and make-believe and challenge the children to be resourceful when filling in the gaps between reality and pretend. The inventive aspect also instills a sense of independence and confidence in one’s ability to put their personal thoughts and ideas on display. This activity also increased the children’s group work and communication skills and allowed them to foster positive relationships with their peers. 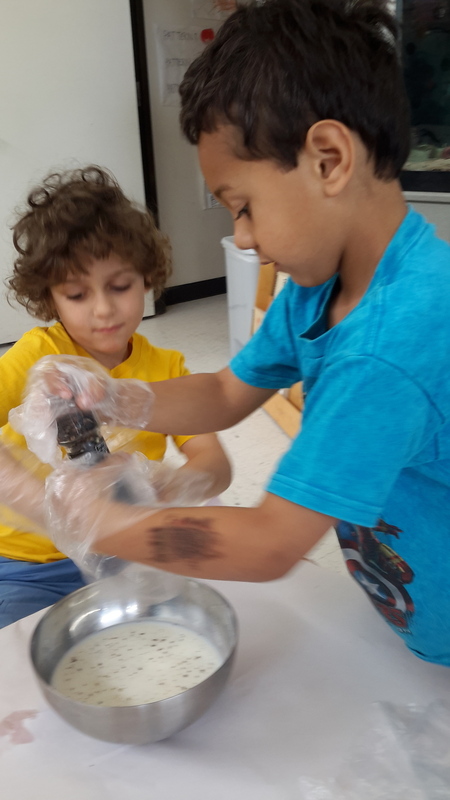 They worked as a team to form the list of needed materials, practiced sharing resources and ideas, helped one another complete tasks, showed support by learning about other’s recipes and built upon leadership skills through the teaching their own recipes. Dramatic play is a valuable aspect of our curriculum because it encourages children to explore a variety of creative ideas, build upon cognitive processes and skills and use knowledge from past experiences to further understanding of real world concepts. A few weeks ago the children created paintings using ice-cream salt and watercolors. We collected the extra salt from their paintings, dried it and put it inside our clear fascinator boxes to create a new exploration. Once the children got their hands on the boxes, they immediately picked up on the percussive possibilities. The children all shook the boxes around joyfully and banged them on the table. One child especially enjoyed shaking the box up and down with both hands while “singing” loudly. He shows exceptional interest in music and is always making a rhythm, dancing or being musical in class. This experience primarily engaged the students’ sense of hearing. The children get in touch with their musical side, gathering an understanding of rhythm and volume. They learned about cause and effect, discovering that the harder and faster they shook their box, the louder and quicker the sound. This drew a connection between physical force, speed and the creation of rhythm. You will notice in the videos that the children respond and react differently to the sounds of their peers shaking their boxes. Two of the children spent some time trading off, with on child shaking his box first, and another responding by shaking her box. The idea that communication can exist through music is shown through these interactions. Ultimately, music and rhythm are important forms of emotional expression. The physical technique and force used when shaking the boxes can serve as an emotional and creative outlet. Shaking the boxes more rapidly and forcefully can exert more extreme emotions like excitement, joy or anger; where as shaking the boxes softly might provide a more soothing experience. Playing with rhythm and sound is not only a fun experience, but also a great way to connect with oneself, interact with others and express emotion and creativity. The children are continuing to explore the fascinating world of caterpillars! 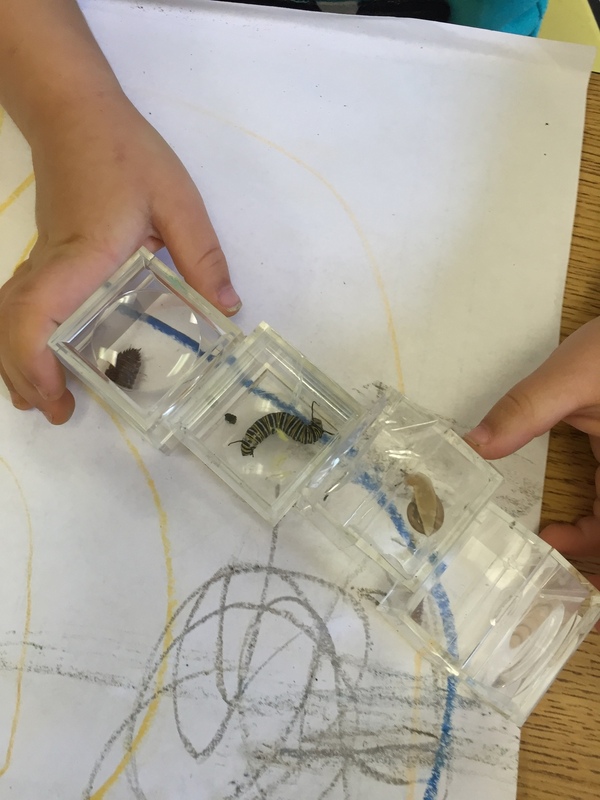 We have been monitoring the caterpillars in the classroom by recreating their environment in a see-through container. 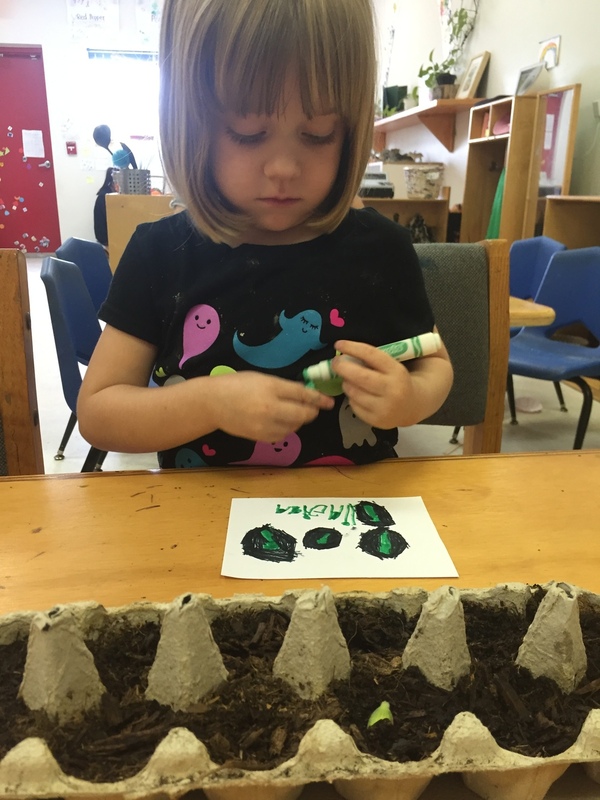 In doing so, the children understand what elements are necessary for the caterpillars to live and what type of environment or habitat they need to survive. Following their explanations, we laid out paper, scissors, glue, yarn, tissue paper and branches. The students used the materials to re-create what they thought the caterpillar’s environment might look like on paper. 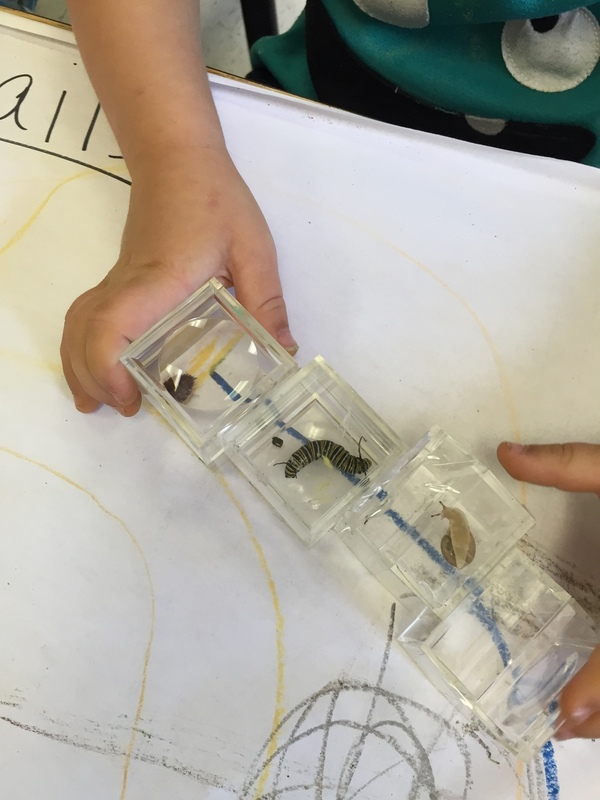 The children used their prior knowledge, gained by studying and observing the caterpillars, to formulate and document their own ideas of environments. We strongly support the documentation of children’s work, as it is key to showing levels of progress in understanding and development. This project allowed the children to be a part of an environment that was rich in open-ended materials and invoked engagement, construction and inventiveness. 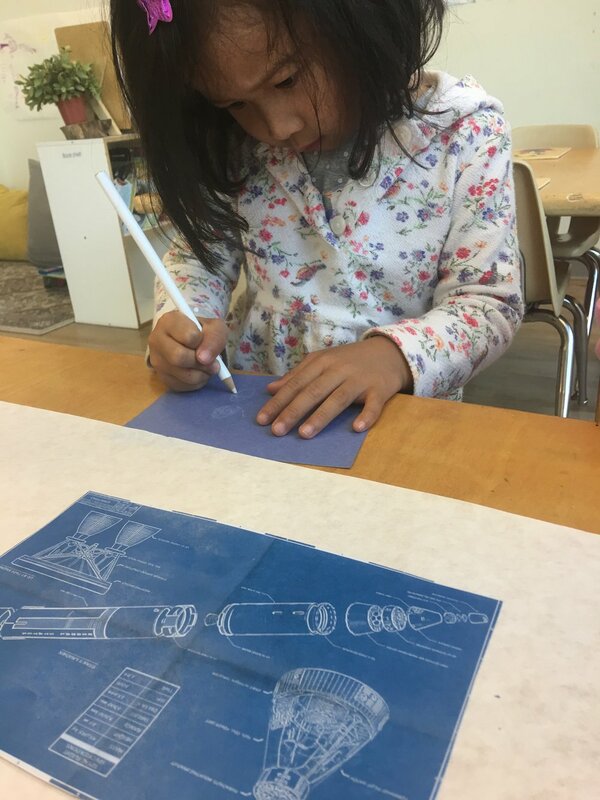 By vocalizing their different definitions of environments, the children were able to practice articulating and refining their own ideas based on the feedback and thoughts of others. Extended periods of interaction with nature is important because it allows the students to gain a full understanding of scientific concepts. The deep level of observation involved in this exploration not only furthers an understanding of natural processes and lifecycles, but also instills an appreciation of and deep interest in the natural world that is key in developing into an environmentally responsible individual. Student feedback has a great deal of influence on our classroom projects. Because we believe learning should be student led, we use questions and statements from students to determine the direction of projects. These statements influence the project work because it helps the teachers analyze how much the children know, in which direction their minds are going or what areas they need practice or improvement in. After this conversation, the children were introduced to the mineral calcium and learned about its role in the human body. After doing some research, we decided to make calcium rich recipe- Cauliflower Soup. During the process of creating this recipe, the children were also introduced to a new vegetable that many of them hadn’t been familiar with - a leek. After discussing our ingredients and their smells, textures and physical characteristics, the children began measuring and adding fractions with our measuring cups. Once we had all of the ingredients mixed, we took our pot to the kitchen where they let it simmer until snack time. Throughout this experience the children got to practice their research and mathematical skills, both of which are foundational aspects of learning. They also learned about the process of cooking, and how to do so in a healthy way, which instills a sense of accomplishment and independence. Understanding the roles of vitamins and minerals and how to cook healthily are all important in maintaining a healthy body. The cauliflower soup was a recipe that the children really enjoyed! It was a delicious treat for our taste buds, healthy for our bodies and an exciting intellectual endeavor. While consuming it was an enjoyable experience, being able to discuss its benefits as we ate together also served as a fun, communal learning experience. This week, the children have been working with Legos. Legos are considered an open-ended material, meaning their transformational possibilities are nearly endless when a child’s creativity and imagination are applied. Because they have no pre-determined purpose or shape with a specific resemblance, they do not place parameters or limitations on what the child can create with them. Therefore, they make a perfect addition to a play-based and child-led environment. 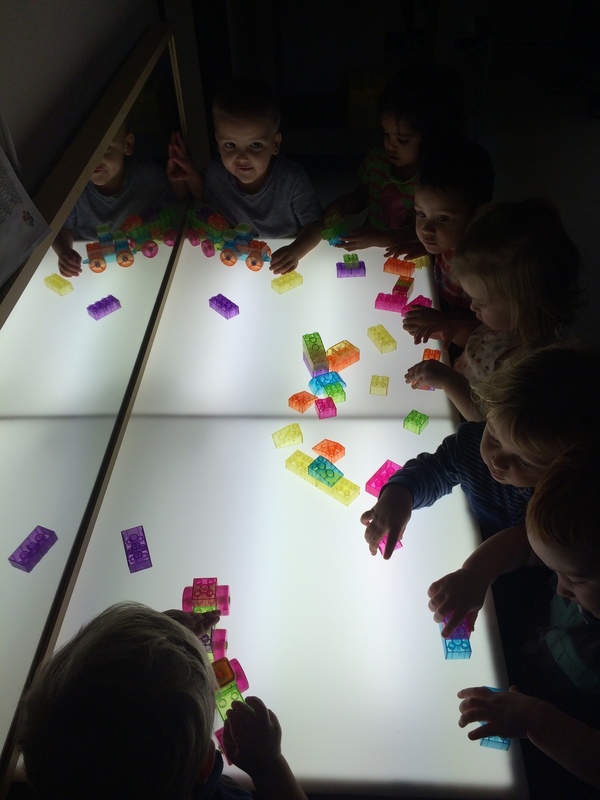 We took the Legos to the light table, giving the children a different perspective of the blocks and allowing them to see how the presence of light impacts and intensifies color. Among the comments the students made, we heard them say that they were building “a truck” and “a train.” In the photos, you will notice the students lining up the Legos and stacking them to create different things. Inside the classroom, the children shifted from their original technique of lining up the Legos to stacking them instead. In doing so, they explored factors like height and the physical, strategic process of stacking objects. 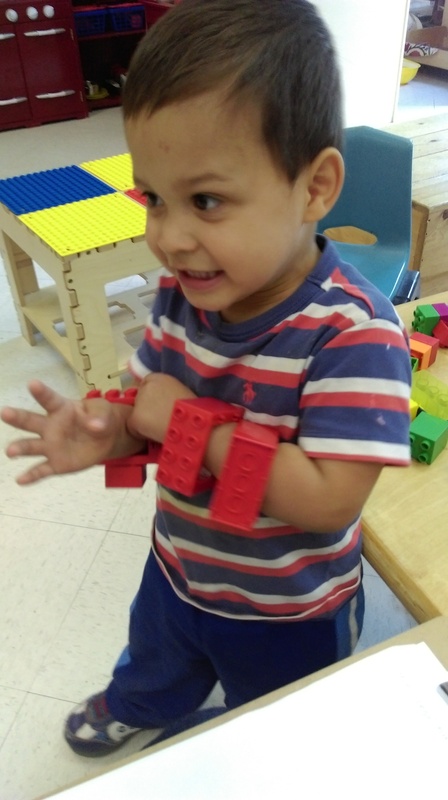 The grasping, reaching and carefully placing involved in stacking and lining up the blocks engaged muscles in the children’s hands and arms, improving their fine motor skills. During this time, we also sorted the colors and counted how many bricks were in front of the students. Some of the children even began counting the circles on top of the Legos. Sorting the blocks allowed the children to practice color recognition, classification and categorization. Counting the blocks reinforced mathematical skills such as number recognition and addition. 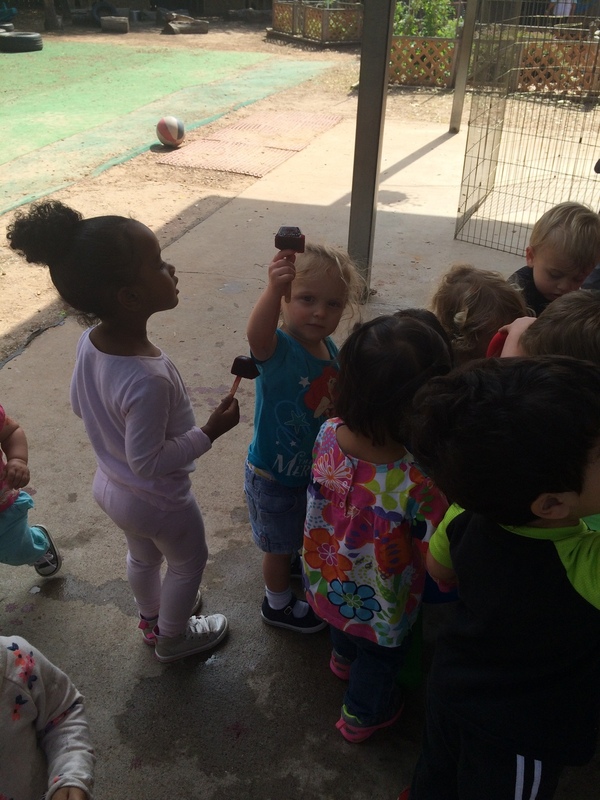 Along with the cognitive skills practiced in this activity, the children also built upon their social skills. They worked together as a team in conceptualizing and implementing the construction of their trucks, trains and other creations. In doing so, they learned to share resources and how to create one cohesive plan from the many thoughts and ideas of different-minded individuals. During our most recent Music Think Tank with Mr. T, a piano was reintroduced to the children. The children have a strong understanding of patterns using colors and sounds. To take our exploration one step further, the children were asked to create a pattern using paper and markers. Over the last few months, the children have developed the skills to create sequences quickly and easily. The children’s marks have gradually improved with each pattern, becoming neater and more precise. Each key on the piano was labeled with a small piece of colored paper and once the children finished their sequences, they were asked to perform them on the instrument. Before the children can play any key to create a sound, they must be able to identify, recognize and match the various colors. This sound-sight exploration has taught the children to do all of the above. Color recognition and name identification are both stepping-stones in childhood development. Early identification of colors helps to create the cognitive link between visual clues and words, engaging the child’s senses while enhancing their vocabulary skills. Through this activity, the children learned that patterns are everywhere. They exist in colors, in sounds and even in behaviors such as daily routines. Understanding the importance of patterns, and how to identify and interpret them, is an important foundational skill for more complex mathematical, scientific and communicative tasks that the children will come across as their education progresses. Blogs for each classroom and think tank members coming soon!